URBANA, Ill. – Corn growers in northern Illinois and surrounding areas are noticing a marked increase in tar spot this year, with 30 percent infection rates in some fields. University of Illinois pathologist Nathan Kleczewski has been fielding daily calls and emails about the disease from concerned producers. The relatively new disease was first described in Illinois near DeKalb in 2015, with additional sightings in Indiana. Since that time, the leaf disease has been detected in northern Illinois each year, but, until now, infections have been sparse and have occured late in the season, minimizing yield loss. Kleczewski says very little is known about tar spot complex, including the epidemiology of the disease and how the pathogens interact with one another and their corn host. In addition, it is possible that the disease may act differently in Midwest production systems, as hybrid genetics, production practices, and environments differ from those in Latin America. That’s why he needs help from corn growers. Kleczewski says growers with symptoms of tar spot, particularly those with necrosis associated with the lesions, should send them to Dianne Plewa at the University of Illinois Plant Disease Clinic. The website with address and contact information is located at https://web.extension.illinois.edu/plantclinic/. Growers should include the corn hybrid, county of origin, and whether a fungicide was applied. Kleczewski says fungicides have had wildly variable effects on the disease this year, so gathering more information on fungicide application and rate will aid in management decisions in the future. Growers who want to get more involved in variety testing and yield response efforts are encouraged to contact Kleczewski at 217-300-3253 or nathank@illinois.edu. He also can be reached on Twitter @ILplantdoc. 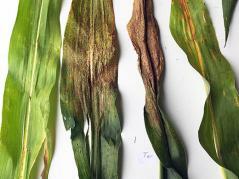 For the latest news on this disease and others, stay tuned to Kleczewski’s blog, at http://cropdisease.cropsciences.illinois.edu/.